300 students and professionals will have just 24 hours to design, build, and present their creations at this year's 2016 Hacking Arts Festival. Running from November 19th to 20th and hosted at the MIT Media Lab in Cambridge, Massachusetts, the hackathon will feature teams from the fields of "design, fashion, film/video, gaming, music, performing arts, virtual/augmented reality, and visual arts." Last year's grand prize winner "created virtual realities of famous works of art including American Gothic and the Birth of Venus" that could be experienced with a VR headset. As with last year, the 2016 Hacking Arts Festival will feature a conference and tech expo, both on the 19th. Vitra—one of the event's top-tier sponsors, along with Adobe and Autodesk—has furnished the hackathon with its newly released "Hack" products. Designed by Konstantin Grcic, the Hack system features an unfinished aesthetic that matches its versatility: It's designed for easy disassembly, transport, and modification for different user configurations and office functions. Early bird tickets are sold-out, but other tickets are still available. Cities such as London, Seattle, San Francisco and almost everywhere else are seeing an influx of young professionals, yet those urban centers are more expensive and more condensed. People are seeking smaller living spaces as an economic opportunity, and while it meshes well with notions of sustainability, the question Ori is tackling is: how do we accommodate a living room, bedroom, closet and office space in a small 200-300 square feet apartment? While these micro living spaces enable developers to provide more housing options and allow renters and buyers affordability and a smaller carbon footprint, they clearly lack the need for life's different accommodations that larger apartments provide. While some may view these small spaces as a necessity, a group of MIT engineers saw this as an opportunity – how do we maximize our use of these spaces, providing the experience of luxury living without the luxury of size? Better yet, what if your living space could physically transform to create any environment you need? We teamed up with Ori to design a system of robotic furniture: transformable units that can triple the usage of a given space. While not on the market just yet, inquiries can be made via Ori's website here. Do you dream of a world in which your touch-screen could touch back? Where you can shape digital models with your hands, physically reach out to friends hundreds of miles away, and once again tangibly interact with the people and objects around you? The Tangible Media Group at MIT’s Media Lab has begun to probe this future of 3D interactive interfaces with their latest creation: inFORM. Functioning similarly to the metal pinscreen toy, inFORM combines a state-of-the-art table-mounted “screen” of 900 movable “pixels,” a hacked Microsoft Kinect, projector, and nearby computer to transmit palpable content back-and-forth between the digital and physical realms. Created by Daniel Leithinger, Sean Follmer, Alex Olwai, Akimitsue Hogge and Hiroshi Ishii, the breakthrough project allows for real-time user interaction with material objects and physicalized digital data, offering a glimpse into the exciting world of user interfaces that lie beyond the depthless, black touch-screens and skeuomorphic displays of today. 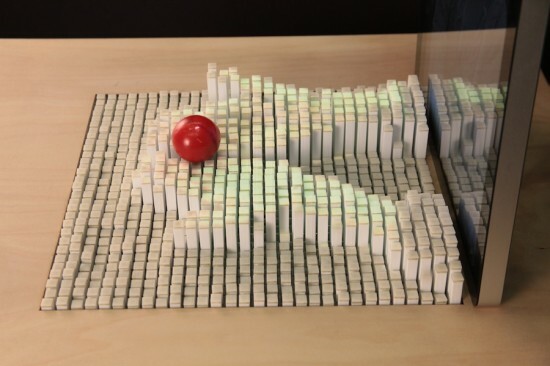 As this technology progresses beyond inFORM’s simple 30x30 display, one could imagine a wealth of emerging applications, from remote medical operations to malleable, tactile architectural renderings, that may effectively unhinge the divide between virtual and corporeal space. A new pavilion created by the Mediated Matter research group at MIT’s Media Lab explores the intersection between material technology, computation, and biological and digital fabrication on an architectural scale. 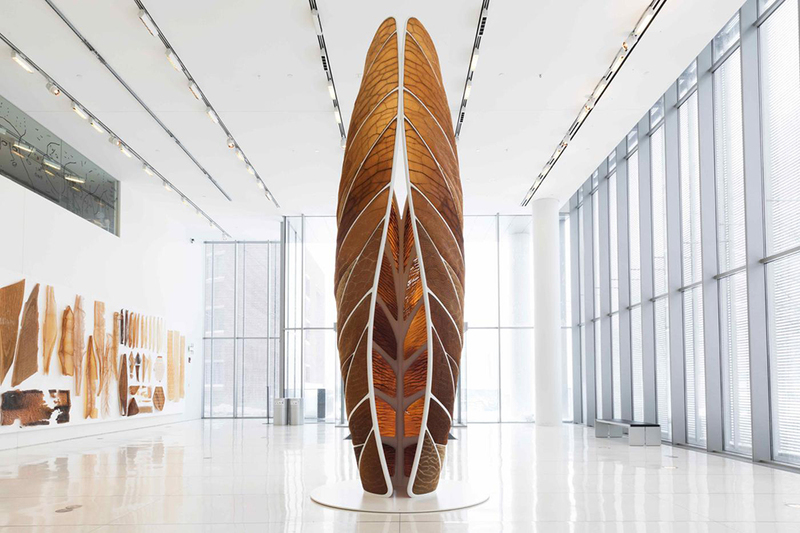 Inspired by the silkworm’s ability to create a 3D cocoon out of a single, 1 km thread, a team of researchers led by architect Neri Oxman created a fibrous, CNC-fabricated scaffold made from 26 polygonal panels and laid out in silk thread. They then let loose 6,500 silkworms onto the frame to fill in the gaps and reinforce the structure. 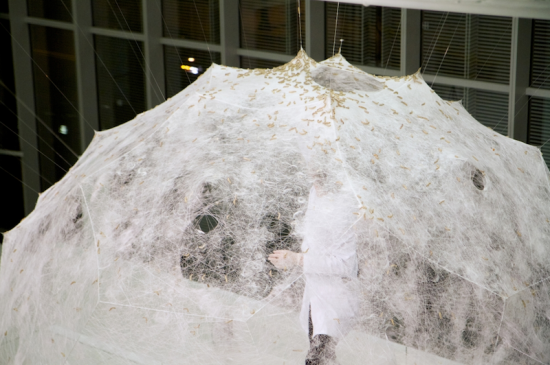 The structure’s silk armature was created by an algorithm, based on site-specific solar trajectories and research on the worms’ behavior, which was then built upon by the worms’ on-site reaction to the structure’s geometries and environmental factors, including heat, light, and density. The worms were attracted to darker and denser areas, leaving a large aperture in the pavilion’s southeast side and producing some areas thicker than others. Mediated Matter’s research with the Silk Pavilion opens up new possibilities for the creation of functionally graded material objects (think the varied, porous interior of bone as opposed to the homogeneity of concrete), fibrous systems for the construction of habitable space, and bio-synthetic structures that are capable of interacting with heir environments. Like their (ideal) mechanical counterparts, these small, squishy 3D-printers can self-replicate. While the silkworms were removed from the pavilion before they could transform into moths, once they metamorphose, those 6,500 grubs could produce 1.5 million more, which in turn could construct 250 additional pavilions. Digital Clay. Last week at the SIGGRAPH technology conference, a prototype input device called "Recompose" made its debut. 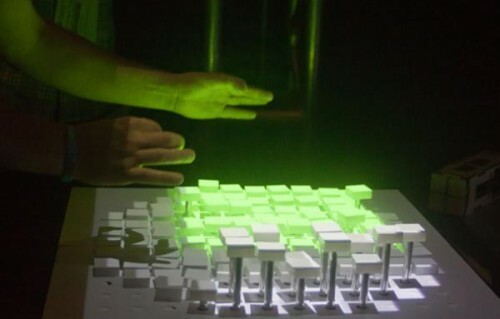 TechNewsDaily says that this "marriage of a keyboard and a 3-D tiled surface could be the future of computer interfaces." Developed by the MIT Media Lab, Recompose will give users the ability to "sculpt" data. LED Lettuce. The Dutch have amped up hydroponic agriculture with the use of LEDs, notes Good magazine. Scientists in the Netherlands have found that using the red and blue versions of the lights maximizes the effects of sunlight and minimizes dehydration. A bonus result? Greenhouses with rave-like ambiance. Flat out Platonic. Core 77 alerted us to the thought-provoking carpet designs of Luís Porém, which are based on deconstructed Plato's beloved polyhedrons. Biker Rights. A group of NYC lawyers ride to the aid of cyclists disputing NYPD tickets for bell, helmet, and lane violations, reports The New York Times. The law firm of Rankin & Taylor is preparing a class action suit against the city on behalf of bikers.